Hip bursitis can be a source of chronic, and even, disabling pain around the hip area if left untreated. The pain can range from the mild and occasional, to severe with significant limitations to mobility. Inflammation of the bursa can be a result of trauma, overuse and even from prior surgery. Let's first give you an idea just what a bursa is. By simple definition, a bursa is a fluid-filled sac that occurs naturally in the body is typically located over a bony prominence and serves to provide padding to this area. They usually can't be seen, and most people don't realize they have them. It is only when a bursa becomes inflamed and swollen, and occasionally even infected, that their presence becomes known. Bursa sacs can be found over a multitude of bony prominences, such as the patella (knee cap), elbow, or heel, and can also be located deeper inside the body, such as the sub-acromial bursa of the shoulder. Our bodies have bursa sacs located over the greater trochanter of each hip. These sacs not only provide padding for these bony areas, but also help to decrease friction when large bands move over the trochanter when walking, running and biking. Occasionally, a bursa sac can become inflamed, and even infected, causing pain over the outside area of the hip. This pain can be sporadic in frequency, or it can be severe and persistent. It can hurt to the touch, and make it difficult-to-impossible to sleep on the affected side. Causes of trochanteric bursitis can include trauma by direct fall onto the outer area of the hip, overuse activities such as running, walking, biking and overuse of exercise equipment. 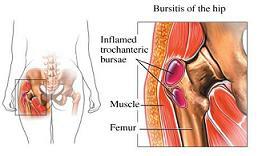 Diagnosis of hip bursitis is mainly by way of the clinical examination, with pain elicited when pressing directly on the bursa. There is also pain when attempting to abduct the leg (lift away from the body) against resistance. Treatment options can range from the use of over-the-counter pain medications and anti-inflammatory agents, to one or more injections of cortisone (steroid; powerful anti-inflammatory agent), to surgical removal of the sac. Surgical removal, however, is no guarantee that the sac will not return, mainly because it is almost impossible to remove every bit of tissue of the sac, and those cells are responsible for its regeneration.